The successful introduction of tumor necrosis factor (TNF) blockade as a highly effective treatment for the different subtypes of spondyloarthritis (SpA) [1Vanden Bosch F, Kruithof E, Baeten D, De Keyser F, Mielants H, Veys EM. Effects of a loading dose regimen of three infusions of chimeric monoclonal antibody to tumour necrosis factor alpha (infliximab) in spondyloarthropathy: an open pilot study Ann Rheum Dis 2000; 59: 428-33.-4Braun J, Brandt J, Listing J, et al. Treatment of active ankylosing spondylitis with infliximab: a randomised controlled multicentre trial Lancet 2002; 359: 1187-93.] has dramatically improved the clinical outcome and quality of life of SpA patients. An unforeseen consequence of this therapeutic success, however, is that clinical trial design in SpA is becoming increasingly challenging. On the one hand, the development of new treatment strategies is still necessary for the following reasons: 1) TNF blockade can be contraindicated in a subset of patients due to its safety profile, 2) a subset of treated patients experience an incomplete or non-response [5Baeten D, Kruithof E, Vanden Bosch F, et al. Systematic safety follow up in a cohort of 107 patients with spondyloarthropathy treated with infliximab: a new perspective on the role of host defence in the pathogenesis of the disease? Ann Rheum Dis 2003; 62: 829-34. ], 3) even in those patients with good clinical response, there is no convincing evidence yet that TNF blockade halts ankylosis [6Van der Heijde D, Landewe R, Einstein S, et al. Radiographic progression of ankylosing spondylitis after up to two years of treatment with etanercept Arthritis Rheum 2008; 58: 1324-31., 7Van der Heijde D, Landewe R, Baraliakos X, et al. Radiographic findings following two years of infliximab therapy in patients with ankylosing spondylitis Arthritis Rheum 2008; 58: 3063-70. ], 4) TNF blockade fails to induce a genuine sustained remission since almost all patients relapse shortly after treatment discontinuation [8Baraliakos X, Listing J, Brandt J, et al. Clinical response to discontinuation of anti-TNF therapy in patients with ankylosing spondylitis after 3 years of continuous treatment with infliximab Arthritis Res Ther 2005; 7: R439-44.]. One way to address this new challenge is to develop sensitive biomarkers of treatment response. A biomarker is a characteristic that can be objectively measured and evaluated as an indicator of a normal biologic process, a pathophysiologic process, or a pharmacologic response to therapeutic intervention [9De Gruttola V, Clax P, Demets DL, et al. Considerations in the evaluation of surrogate endpoints in clinical trials. summary of a National Institutes of Health workshop Control Clin Trials 2001; 22: 485-502.]. As such, changes in biomarkers during treatment indicate that this treatment has a genuine effect on a specific biologic process of interest. When such a marker additionally reflects a clinical outcome in a reliable, sensitive, and reproducible way, it can be evaluated as surrogate marker in individual patients. In the context of early proof-of-concept evaluation of new treatment modalities, one aims to see a clear biological effect at the group level rather than to predict individual clinical responses. Accordingly, we will focus here on biomarkers in this specific context and will not discuss their potential application as surrogate markers in clinical practice. As to the first question, it is important to notice that SpA is not a genuine systemic disease but rather a disorder which specifically affects distinct tissues exposed to mechanical or microbial stress. Accordingly, it is more likely that important pathophysiologic processes can be detected in the affected tissue than in peripheral blood. Of the affected tissues, the axial skeleton is the most frequent site of inflammation in AS as well as SpA as a whole but is extremely difficult to access. The studies of inflamed axial tissue are thus restricted to surgical samples or necropsy material [10Appel H, Kuhne M, Spiekermann S, et al. Immunohistologic analysis of zygapophyseal joints in patients with ankylosing spondylitis Arthritis Rheum 2006; 54: 2845-51., 11Francois RJ, Gardner DL, Degrave EJ, Bywaters EG. Histopathologic evidence that sacroiliitis in ankylosing spondylitis is not merely enthesitis Arthritis Rheum 2000; 43: 2011-4.] and sequential sampling during treatment is technically impossible. In contrast, peripheral joint synovium, gut tissue, and skin can easily be accessed during active disease. As no studies have been performed on sequential gut biopsies in SpA and as tissue response in the skin in the context of PsA will be discussed in a separate chapter of this journal, we will focus here on peripheral joint synovium. Indeed, this tissue is an attractive target for biomarker research since more than half of the SpA patients and approximately one third of the AS patients have peripheral disease with preferential involvement of large joints such as ankles and knees, from which it is relatively easy to obtain sequential synovial tissue biopsies by needle arthroscopy [12Baeten D, Van den Bosch F, Elewaut D, Stuer A, Veys EM, De Keyser F. Needle arthroscopy of the knee with synovial biopsy sampling: technical experience in 150 patients Clin Rheumatol 1999; 18: 434-1.]. As the synovial immunopathology is unaltered by the procedure or by ineffective therapy [13Smeets TJ, Kraan MC, Versendaal J, Breedveld FC, Tak PP. Analysis of serial synovial biopsies in patients with rheumatoid arthritis: description of a control group without clinical improvement after treatment with interleukin 10 or placebo J Rheumatol 1999; 26: 2089-93., 14Kruithof E, Baeten D, Van den Bosch F, Mielants H, Veys EM, De Keyser F. Histological evidence that infliximab treatment leads to downregulation of inflammation and tissue remodelling of the synovial membrane in spondyloarthropathy Ann Rheum Dis 2005; 64: 529-36. ], this approach allows to investigate the modulation of synovial immunopathology by novel treatments. The second question is whether the synovial immunopathology is similar or not between different SpA subtypes. A number of early studies have compared the synovial histopathology of distinct SpA subtypes with rheumatoid arthritis (RA) (Fig. 1 ). The most consistent finding of these studies is a decreased synovial lining hyperplasia and an increased vascularity in both ReA and PsA in comparison with RA [15Ceponis A, Konttinen YT, Imai S, et al. Synovial lining, endothelial and inflammatory mononuclear cell proliferation in synovial membranes in psoriatic and reactive arthritis: a comparative quantitative morphometric study Br J Rheumatol 1998; 37: 170-8.-20Van Kuijk AW, Reinders-Blankert P, Smeets TJ, Dijkmans BA, Tak PP. Detailed analysis of the cell infiltrate and the expression of mediators of synovial inflammation and joint destruction in the synovium of patients with psoriatic arthritis: implications for treatment Ann Rheum Dis 2006; 65: 1551-7.]. However, none of these studies directly compared different SpA subtypes. A recent systematic comparison between AS/USpA, PsA, and RA showed that the SpA subtypes shared the same immunopathologic features with significantly greater vascularity as well as infiltration with neutrophils and CD163+ macrophages compared to RA [21Kruithof E, Baeten D, De Rycke L, et al. Synovial histopathology of psoriatic arthritis, both oligo- and polyarticular, resembles spondyloarthropathy more than it does rheumatoid arthritis Arthritis Res Ther 2005; 7: R569-80.]. In contrast, lining layer thickness and the number of CD83+ dendritic cells were significantly increased in RA compared to AS/USpA as well as to PsA. In line with previous studies [22Baeten D, Peene I, Union A, et al. Specific presence of intracellular citrullinated proteins in rheumatoid arthritis synovium: relevance to antifilaggrin autoantibodies Arthritis Rheum 2001; 44: 2255-62., 23Baeten D, Steenbakkers PG, Rijnders AM, Boots AM, Veys EM De, Keyser F. Detection of major histocompatibility complex/human cartilage gp-39 complexes in rheumatoid arthritis synovitis as a specific and independent histologic marker Arthritis Rheum 2004; 50: 444-51. ], none of the SpA subtypes had positive staining for intracellular citrullinated proteins or major histocompatibility complex/human cartilage glycoprotein-39 complexes whereas >40% of the RA samples were positive for both markers. Moreover, there were no histological differences between oligo-articular and poly-articular PsA. The pathophysiologic similarities in synovial inflammation between different SpA subtypes and in particular between AS/USpA and PsA have recently been confirmed by the analysis of the inflammatory milieu in SpA and RA: the different SpA subtypes showed a consistent decrease in classically activated macrophage-derived mediators such as TNF and IL-1 in comparison with RA [24Vandooren B, Noordenbos T, Ambarus C, et al. Absence of a classically activated macrophage cytokine signature in peripheral spondylarthritis, including psoriatic arthritis Arthritis Rheum 2009; 60: 966-75.]. Coming back to the question which tissue should be sampled, it is also important to note that the alternatively activated CD163+ macrophages were not only increased in SpA synovium but also in gut biopsies of SpA and IBD patients [25Baeten D, Demetter P, Cuvelier CA, et al. Macrophages expressing the scavenger receptor CD163: a link between immune alterations of the gut and synovial inflammation in spondyloarthropathy J Pathol 2002; 196: 343-50., 26Demetter P, De Vos M, Van Huysse JA, et al. 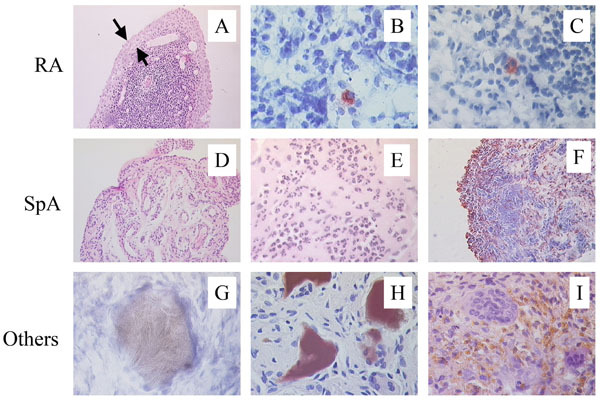 Colon mucosa of patients both with spondyloarthritis and Crohn's disease is enriched with macrophages expressing the scavenger receptor CD163 Ann Rheum Dis 2005; 64: 321-4.]. 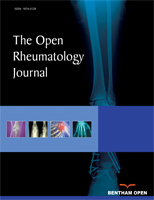 Although further research in potential synovial differences between SpA subtypes remains warranted, these data consistently indicate that the different SpA subtypes have largely similar synovial immunopathological characteristics which discriminates them from other inflammatory arthritides such as RA [27Baeten D, Kruithof E, De Rycke L, et al. Diagnostic classification of spondylarthropathy and rheumatoid arthritis by synovial histopathology: a prospective study in 154 consecutive patients Arthritis Rheum 2004; 50: 2931-41., 28Baeten D, Demetter P, Cuvelier C, et al. Comparative study of the synovial histology in rheumatoid arthritis, spondyloarthropathy, and osteoarthritis: influence of disease duration and activity Ann Rheum Dis 2000; 59: 945-53.]. As there are no studies on synovial tissue response to treatment in AS solely but only in SpA as a group, and as the previously described synovial features correlate with disease activity across the different SpA subtypes [29Baeten D, Kruithof E, De Rycke L, et al. Infiltration of the synovial membrane with macrophage subsets and polymorphonuclear cells reflects global disease activity in spondyloarthropathy Arthritis Res Ther 2005; 7: R359-69. ], we will review the synovial response to treatment for the peripheral SpA group as a whole. Indeed, the only subset of SpA which has been studied as a separate entity is PsA as discussed in a different review article in this issue of the journal. Although in RA (and to a lesser extend in PsA) the synovial tissue response has been studied for a large array of disease modifying antirheumatic drugs (DMARDs) and biologicals [30Haringman JJ, Gerlag DM, Zwinderman AH, et al. Synovial tissue macrophages: a sensitive biomarker for response to treatment in patients with rheumatoid arthritis Ann Rheum Dis 2005; 64: 834-.-34Vos K, Thurlings RM, Wijbrandts CA, van Schaardenburg D, Gerlag DM, Tak PP. Early effects of rituximab on the synovial cell infiltrate in patients with rheumatoid arthritis Arthritis Rheum 2007; 56: 772-8. ], studies in SpA have only assessed the effect of TNF blockade with infliximab [14Kruithof E, Baeten D, Van den Bosch F, Mielants H, Veys EM, De Keyser F. Histological evidence that infliximab treatment leads to downregulation of inflammation and tissue remodelling of the synovial membrane in spondyloarthropathy Ann Rheum Dis 2005; 64: 529-36., 35Baeten D, Kruithof E, Van den Bosch F, et al. Immunomodulatory effects of antitumor necrosis factor alpha therapy on synovium in spondylarthropathy: histologic findings in eight patients from an open-label pilot study Arthritis Rheum 2001; 44: 186-95.] and etanercept [36Kruithof E, De Rycke L, Roth J, et al. Immunomodulatory effects of etanercept on peripheral joint synovitis in the spondylarthropathies Arthritis Rheum 2005; 52: 3898-909.]. This is partially related to the lack of efficacy of classical DMARDs, with the exception of sulphasalazine, as well as novel biologicals in peripheral SpA. It remains thus unclear whether the synovial changes observed with TNF blockers reflect specific mechanisms of action of this class of drugs or can be used more broadly as biomarkers of effective treatment in peripheral SpA. A first major observation is that the global inflammatory cell infiltration is significantly reduced upon treatment with TNF blockade. Studies with infliximab in patients with different SpA subtypes demonstrated that especially infiltrating polymorphonuclear (PMN) cells and MRP8+ monocytes were rapidly reduced, which was already the case 1 or 2 weeks after the first infusion [35Baeten D, Kruithof E, Van den Bosch F, et al. Immunomodulatory effects of antitumor necrosis factor alpha therapy on synovium in spondylarthropathy: histologic findings in eight patients from an open-label pilot study Arthritis Rheum 2001; 44: 186-95.]. This trend was further confirmed after 12 weeks of infliximab, when not only infiltrating monocytes and granulocytes, but also resident tissue CD163+ macrophages and T lymphocytes were significantly reduced [14Kruithof E, Baeten D, Van den Bosch F, Mielants H, Veys EM, De Keyser F. Histological evidence that infliximab treatment leads to downregulation of inflammation and tissue remodelling of the synovial membrane in spondyloarthropathy Ann Rheum Dis 2005; 64: 529-36., 35Baeten D, Kruithof E, Van den Bosch F, et al. Immunomodulatory effects of antitumor necrosis factor alpha therapy on synovium in spondylarthropathy: histologic findings in eight patients from an open-label pilot study Arthritis Rheum 2001; 44: 186-95., 37De Rycke L, Baeten D, Foell D, et al. Differential expression and response to anti-TNFalpha treatment of infiltrating versus resident tissue macrophage subsets in autoimmune arthritis J Pathol 2005; 206: 17-27.]. Similar effects were observed with etanercept and the decrease in synovial infiltration was maintained or even augmented on the long term [36Kruithof E, De Rycke L, Roth J, et al. Immunomodulatory effects of etanercept on peripheral joint synovitis in the spondylarthropathies Arthritis Rheum 2005; 52: 3898-909.]. The decrease of the cellular infiltration upon TNF blockade could be due to a diminished influx, an increased local apoptosis, and/or an accelerated efflux of these cells. The fact that the number of infiltrating MRP8+ and MRP14+ monocytes is reduced more rapidly and more profoundly than the number of CD163+ resident tissue macrophages in the synovial tissue, together with the early and significant decrease of serum MRP8/MRP14 levels in contrast to the sCD163 levels, strongly suggest a primary effect on inflammatory cell recruitment into the inflamed synovial tissue by TNF blockade [37De Rycke L, Baeten D, Foell D, et al. Differential expression and response to anti-TNFalpha treatment of infiltrating versus resident tissue macrophage subsets in autoimmune arthritis J Pathol 2005; 206: 17-27.]. This hypothesis is further confirmed by the treatment-induced down-regulation of the number of synovial blood vessels as assessed by CD146 and von Willebrand Factor (vWF) immunostaining as well as the expression of markers of neovascularisation such as αVβ3 integrin, angiogenic factors such as synovial matrix metalloproteinase (MMP)-9, and adhesion molecules [14Kruithof E, Baeten D, Van den Bosch F, Mielants H, Veys EM, De Keyser F. Histological evidence that infliximab treatment leads to downregulation of inflammation and tissue remodelling of the synovial membrane in spondyloarthropathy Ann Rheum Dis 2005; 64: 529-36., 35Baeten D, Kruithof E, Van den Bosch F, et al. Immunomodulatory effects of antitumor necrosis factor alpha therapy on synovium in spondylarthropathy: histologic findings in eight patients from an open-label pilot study Arthritis Rheum 2001; 44: 186-95., 36Kruithof E, De Rycke L, Roth J, et al. Immunomodulatory effects of etanercept on peripheral joint synovitis in the spondylarthropathies Arthritis Rheum 2005; 52: 3898-909., 38Goedkoop AY, Kraan MC, Picavet DI, et al. Deactivation of endothelium and reduction in angiogenesis in psoriatic skin and synovium by low dose infliximab therapy in combination with stable methotrexate therapy: a prospective single-centre study Arthritis Res Ther 2004; 6: R326-34., 39Vandooren B, Kruithof E, Yu DT, et al. Involvement of matrix metalloproteinases and their inhibitors in peripheral synovitis and down-regulation by tumor necrosis factor alpha blockade in spondylarthropathy Arthritis Rheum 2004; 50: 2942-53.]. The reduction of hypervascularity and endothelial activation is likely to restrain the migration and homing of inflammatory cells into the synovium. As for the contribution of local cell death, a couple of studies in Crohn’s disease have proposed that apoptosis of activated lymphocytes by outside-in signaling is likely to play a role in the immunomodulating effect of infliximab. The absence of this effect by etanercept could thus potentially explain the lack of efficacy of this drug in IBD. However, the successful use of certolizumab, a pegylated TNF blocker which does not induce cell death, in Crohn’s disease [40Sandborn WJ, Feagan BG, Stoinov S, et al. Certolizumab pegol for the treatment of Crohn's disease N Engl J Med 2007; 357: 228-38., 41Schreiber S, Rutgeerts P, Fedorak RN, et al. A randomized, placebo-controlled trial of certolizumab pegol (CDP870) for treatment of Crohn's disease Gastroenterology 2005; 129: 807-18.] challenges this theory. As to arthritis, only one study in RA has reported a contribution of apoptosis to the synovial effects of TNF blockade [42Catrina AI, Trollmo C, af Klint E, et al. Evidence that anti-tumor necrosis factor therapy with both etanercept and infliximab induces apoptosis in macrophages, but not lymphocytes, in rheumatoid arthritis joints: extended report Arthritis Rheum 2005; 52: 61-72.]. In contrast with the IBD studies, this report suggests apoptosis of macrophages rather than lymphocytes and found this effect both with etanercept and infliximab. However, the large majority of studies in RA, PsA, as well as SpA could not provide evidence for an increased synovial cell death upon TNF blockade, making it unlikely that this mechanism plays a dominant role in the synovial tissue response [43Smeets TJ, Kraan MC, van Loon ME, Tak PP. Tumor necrosis factor alpha blockade reduces the synovial cell infiltrate early after initiation of treatment, but apparently not by induction of apoptosis in synovial tissue Arthritis Rheum 2003; 48: 2155-62.-46Cantaert T, De Rycke L, Mavragani CP, et al. Exposure to nuclear antigens contributes to the induction of humoral autoimmunity during tumour necrosis factor alpha blockade Ann Rheum Dis 2009; 68: 1022-9.]. A third and most intriguing hypothesis is that TNF blockade does not only reduce the influx but also promotes the efflux of inflammatory cells from the inflamed tissue. This theory is supported by a recent study in the TNF transgenic mouse model of arthritis showing an increase of synovial lymphatic vessels upon TNF blockade [47Polzer K, Baeten D, Soleiman A, et al. Tumour necrosis factor blockade increases lymphangiogenesis in murine and human arthritic joints Ann Rheum Dis 2008; 67: 1610-6.]. A similar increase of lymphatic vessels was observed in RA and SpA synovium upon infliximab treatment. In sharp contrast with the effect on neutrophils, macrophages, and T lymphocytes, the synovial infiltration with B cells and plasma cells was not reduced upon treatment and in a few cases the presence of plasma cells was even clearly augmented [14Kruithof E, Baeten D, Van den Bosch F, Mielants H, Veys EM, De Keyser F. Histological evidence that infliximab treatment leads to downregulation of inflammation and tissue remodelling of the synovial membrane in spondyloarthropathy Ann Rheum Dis 2005; 64: 529-36., 35Baeten D, Kruithof E, Van den Bosch F, et al. Immunomodulatory effects of antitumor necrosis factor alpha therapy on synovium in spondylarthropathy: histologic findings in eight patients from an open-label pilot study Arthritis Rheum 2001; 44: 186-95.-37De Rycke L, Baeten D, Foell D, et al. Differential expression and response to anti-TNFalpha treatment of infiltrating versus resident tissue macrophage subsets in autoimmune arthritis J Pathol 2005; 206: 17-27.]. Downregulation of the number of CD68+ macrophages and T cells with unchanged number of B cells and plasma cells was also observed in two other studies involving treatment with infliximab in patients with PsA [45Goedkoop AY, Kraan MC, Teunissen MB, et al. Early effects of tumour necrosis factor alpha blockade on skin and synovial tissue in patients with active psoriasis and psoriatic arthritis Ann Rheum Dis 2004; 63: 769-3., 48Canete JD, Pablos JL, Sanmarti R, et al. Antiangiogenic effects of antitumor necrosis factor alpha therapy with infliximab in psoriatic arthritis Arthritis Rheum 2004; 50: 1636-41.]. Whereas the exact biological meaning and the underlying mechanisms of these findings are still unclear, it suggests that TNF blockade does not affect or even promotes infiltration, survival, local proliferation, and/or differentiation of B cells but no other leucocytes. Interestingly, this phenomenon is completely uncoupled from clinical or histological inflammation and thus indicates that these B cells and plasma cells are probably not primary players in the synovial immunopathology in SpA [49Baeten D, Kruithof E, Breban M, Tak PP. Spondylarthritis in the absence of B lymphocytes Arthritis Rheum 2008; 58: 730-3.]. This should also be interpreted in the context of other signs of de novo B cell activation upon treatment with infliximab such as the impressive induction of anti-nuclear antibodies (ANA) and IgM anti-dsDNA antibodies [50De Rycke L, Baeten D, Kruithof E, Van den Bosch F, Veys EM, De Keyser F. Infliximab, but not etanercept, induces IgM anti-double-stranded DNA autoantibodies as main antinuclear reactivity: biologic and clinical implications in autoimmune arthritis Arthritis Rheum 2005; 52: 2192-01., 51De Rycke L, Kruithof E, Van Damme N, et al. Antinuclear antibodies following infliximab treatment in patients with rheumatoid arthritis or spondylarthropathy Arthritis Rheum 2003; 48: 1015-23.] and warrants further investigation of B cell biology in SpA. In this context, it is interesting to note that the microarchitectural organization of infiltrating B cells in ectopic lymphoid structures is not restricted to seropositive diseases such as RA but is equally found in seronegative joint inflammation including the different subtypes of SpA [52Canete JD, Santiago B, Cantaert T, et al. Ectopic lymphoid neogenesis in psoriatic arthritis Ann Rheum Dis 2007; 66: 720-6.-55Thurlings RM, Wijbrandts CA, Mebius RE, et al. Synovial lymphoid neogenesis does not define a specific clinical rheumatoid arthritis phenotype Arthritis Rheum 2008; 58: 1582-9.]. Accordingly, synovial ectopic lymphoid neogenesis is more related to the degree of local inflammation than to the presence of autoantibodies and is downregulated by TNF blockade in SpA. It has been suggested that activation of innate immune cells in the gut and in the joints by microbial pathogens may be relevant to inflammation in SpA with a special role for the CD163+ macrophage subpopulation [25Baeten D, Demetter P, Cuvelier CA, et al. Macrophages expressing the scavenger receptor CD163: a link between immune alterations of the gut and synovial inflammation in spondyloarthropathy J Pathol 2002; 196: 343-50.]. This has been linked to toll like receptors (TLRs). TLR-2 and TLR-4 bind to components of both Gram-positive and Gram-negative bacteria. Following ligand binding TLRs activate a signaling cascade which results in the production of mediators of inflammation. TLRs have been identified in RA synovium and have been shown to play an important functional role in experimental arthritis models. The synovial expression of both TLR-2 and TLR-4 is significantly higher in SpA than in RA despite similar levels of local inflammation [56De Rycke L, Vandooren B, Kruithof E, De Keyser F, Veys EM, Baeten D. Tumor necrosis factor alpha blockade treatment down-modulates the increased systemic and local expression of Toll-like receptor 2 and Toll-like receptor 4 in spondylarthropathy Arthritis Rheum 2005; 52: 2146-58.]. Both infliximab and etanercept sharply down-regulate the synovial TLR expression. These findings highlight the potential role of innate immunity related inflammation in SpA and provide new insights into the mode of action of TNF blockade. As the inflamed synovium plays a crucial role in structural damage to articular cartilage and bone, it is important to know whether TNF blockade only blocks inflammation or also affects mechanisms of joint destruction. The synovial intimal lining layer, consisting of both fibroblast-like synoviocytes (FLS) and macrophages, plays an important role in this process by promoting osteoclast differentiation and activation through the RANK-RANKL system, by production of MMPs which can degrade cartilage, and by a direct effect of the FLS-adhesion molecule cadherin-11 on cartilage [57Lee DM, Kiener HP, Agarwal SK, et al. Cadherin-11 in synovial lining formation and pathology in arthritis Science 2007; 315: 1006-.]. TNF blockade appears to influence several of these factors in the inflamed SpA synovium. Firstly, TNF blockade reduces the degree of lining layer hyperplasia [14Kruithof E, Baeten D, Van den Bosch F, Mielants H, Veys EM, De Keyser F. Histological evidence that infliximab treatment leads to downregulation of inflammation and tissue remodelling of the synovial membrane in spondyloarthropathy Ann Rheum Dis 2005; 64: 529-36., 35Baeten D, Kruithof E, Van den Bosch F, et al. Immunomodulatory effects of antitumor necrosis factor alpha therapy on synovium in spondylarthropathy: histologic findings in eight patients from an open-label pilot study Arthritis Rheum 2001; 44: 186-95., 36Kruithof E, De Rycke L, Roth J, et al. Immunomodulatory effects of etanercept on peripheral joint synovitis in the spondylarthropathies Arthritis Rheum 2005; 52: 3898-909.]. The thickness of the synovial lining was even normalized after long-term treatment. This effect is likely to be mediated by a reduction of TNF-induced proliferation and/or a restoration of Fas-mediated apoptotic cell death of synovial fibroblasts [58Ohshima S, Mima T, Sasai M, et al. Tumour necrosis factor alpha (TNF-alpha) interferes with Fas-mediated apoptotic cell death on rheumatoid arthritis (RA) synovial cells: a possible mechanism of rheumatoid synovial hyperplasia and a clinical benefit of anti-TNF-alpha therapy for RA Cytokine 2000; 12: 281-8. ], since the number of CD55+ synovial lining fibroblasts were significantly reduced after treatment [35Baeten D, Kruithof E, Van den Bosch F, et al. Immunomodulatory effects of antitumor necrosis factor alpha therapy on synovium in spondylarthropathy: histologic findings in eight patients from an open-label pilot study Arthritis Rheum 2001; 44: 186-95.]. Secondly, both MMPs and their inhibitors, tissue inhibitor metalloproteinases (TIMPs), were not only abundantly expressed in SpA synovitis but were rapidly and profoundly downregulated by TNF blockade [39Vandooren B, Kruithof E, Yu DT, et al. Involvement of matrix metalloproteinases and their inhibitors in peripheral synovitis and down-regulation by tumor necrosis factor alpha blockade in spondylarthropathy Arthritis Rheum 2004; 50: 2942-53.]. Thirdly, the expression of cadherin-11 by FLS appeared to be TNF-driven in vitro and, accordingly, was significantly downregulated by anti-TNF treatment in vivo [59Vandooren B, Cantaert T, ter Borg M, et al. Tumor necrosis factor alpha drives cadherin 11 expression in rheumatoid inflammation Arthritis Rheum 2008; 58: 3051-62.]. All these effects may contribute to halt the structural damage as demonstrated by the absence of progression of radiological damage over a 2-years period of follow up [36Kruithof E, De Rycke L, Roth J, et al. Immunomodulatory effects of etanercept on peripheral joint synovitis in the spondylarthropathies Arthritis Rheum 2005; 52: 3898-909.]. In contrast with MMPs and cadherin-11, the abundant synovial expression of RANK, RANKL, and osteoprotegerin (OPG) in SpA synovitis appeared to be largely independent of the degree of synovial inflammation and was thus only downregulated by TNF blockade in the subset of patients with the largest systemic response [60Vandooren B, Cantaert T, Noordenbos T, Tak PP, Baeten D. The abundant synovial expression of the RANK/RANKL/Osteoprotegerin system in peripheral spondylarthritis is partially disconnected from inflammation Arthritis Rheum 2008; 58: 718-29.]. However, this absence of effect on the RANK/RANKL/OPG system does not necessarily mean that TNF blockade does not affect osteoclast differentiation and activation as TNF itself has a direct role in this process [61Vandooren B, Melis L, Veys EM, Tak PP, Baeten D. In vitro spontaneous osteoclastogenesis of human peripheral blood mononuclear cells is not crucially dependent on T lymphocytes Arthritis Rheum 2009; 60: 1020-5.]. Finally, it should be noted that the effect of TNF blockade on synovial mediators of new bone formation and ankylosis, such as the bone morphogenetic protein (BMP) and Wnt signaling pathways, remains largely unexplored in SpA. The analysis of tissue response to targeted therapies appears to be a novel and elegant approach to study the immunopathology of human disease in vivo. This is of particular importance in SpA as there is scarcity of appropriate experimental models for this disease. The use of such therapies allows to assess if such pathways are TNF-driven or not and whether specific cell types or molecules really contribute to the synovial inflammation. Although the studies performed until today are largely restricted to immunohistology, the translational combination of novel targeted therapies and more sophisticated molecular methods to analyze gene expression, T cell receptor (TCR) and B cell receptor (BCR) repertoires, … are likely to reveal fundamental disease mechanisms in the near future [62Bonarius HP, Baas F, Remmerswaal EB, et al. Monitoring the T-cell receptor repertoire at single-clone resolution PLoS One 2006; 1: e55.-64Rihl M, Baeten D, Seta N, et al. Technical validation of cDNA based microarray as screening technique to identify candidate genes in synovial tissue biopsy specimens from patients with spondyloarthropathy Ann Rheum Dis 2004; 63: 498-507.]. The discussed studies also raise the possibility to use synovial immunopathology as an additional biomarker to discriminate between effective and ineffective treatment in early phase clinical trials in SpA. In a proof-of-concept study, we demonstrated that changes in different macrophage subsets (CD163+ resident tissue macrophages and infiltrating MRP8+ or MRP14+ monocytes), PMN cells, and MMP-3 expression are superior to C reactive protein (CRP) to discriminate between TNF blockade and placebo treatment in SpA [65Kruithof E, De Rycke L, Vandooren B, et al. Identification of synovial biomarkers of response to experimental treatment in early-phase clinical trials in spondylarthritis Arthritis Rheum 2006; 54: 1795-804.]. As not all SpA patients have peripheral arthritis and as it remains unclear to what extend peripheral and axial disease are driven by the same processes, it is important that several synovial markers (such as MMP-3 and MRP8/14) can easily and reliably be measured in serum [37De Rycke L, Baeten D, Foell D, et al. Differential expression and response to anti-TNFalpha treatment of infiltrating versus resident tissue macrophage subsets in autoimmune arthritis J Pathol 2005; 206: 17-27., 39Vandooren B, Kruithof E, Yu DT, et al. Involvement of matrix metalloproteinases and their inhibitors in peripheral synovitis and down-regulation by tumor necrosis factor alpha blockade in spondylarthropathy Arthritis Rheum 2004; 50: 2942-53., 66Yang C, Gu J, Rihl M, et al. Serum levels of matrix metalloproteinase 3 and macrophage colony-stimulating factor 1 correlate with disease activity in ankylosing spondylitis Arthritis Rheum 2004; 51: 691-9.]. This approach will not be restricted to markers of synovial inflammation as soluble biomarkers of cartilage and bone metabolism also appears to be modulated by TNF blockade in SpA [67Mullan RH, Matthews C, Bresnihan B, et al. Early changes in serum type II collagen biomarkers predict radiographic progression at one year in inflammatory arthritis patients after biologic therapy Arthritis Rheum 2007; 56: 2919-8., 68Vandooren B, Cantaert T, van Lierop MJ, et al. Melanoma inhibitory activity, a biomarker related to chondrocyte anabolism, is reversibly suppressed by proinflammatory cytokines in rheumatoid arthritis Ann Rheum Dis 2009; 68: 1044-50.]. The main challenge will thus be to set up a panel of reliable markers reflecting the pivotal biologic processes of SpA pathogenesis (including enchondral bone formation) and to assess this panel across different targeted treatment strategies in both axial and peripheral SpA.